Running up and down a building vertically. Hopping between missiles being fired at you by a helicopter to cut it in half. Ripping spines out of other cyborgs to heal yourself. These are a few of the things you will do in Metal Gear Rising: Revengeance. It’s an absolute blitz of giving physics the finger, but can be incredibly frustrating at times. Using his sword with his foot is one of the least impressive things Raiden does. 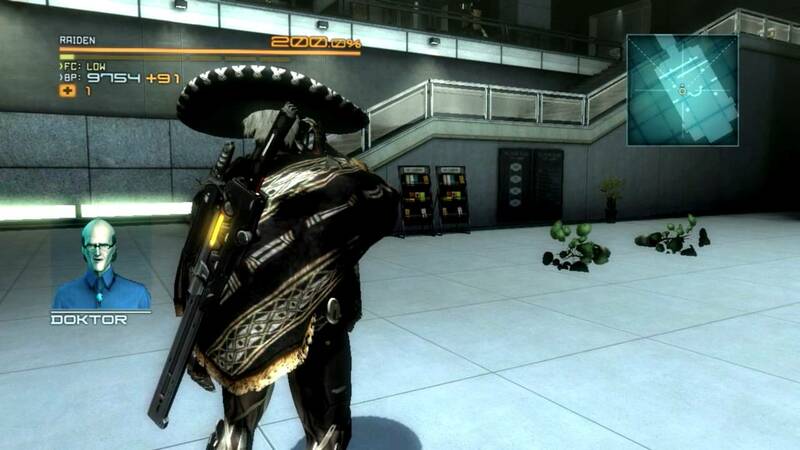 Metal Gear Rising: Revengeance is as much a hack-and-slash game as you can get. Raiden, a cyborg of previous Metal Gear fame, now works for a private military company, guarding the prime minster of an African nation who is kidnapped by another military group. Said prime minister is quickly murdered in cold blood, as it’s revealed that the opposing PMC wants to incite war to make money. 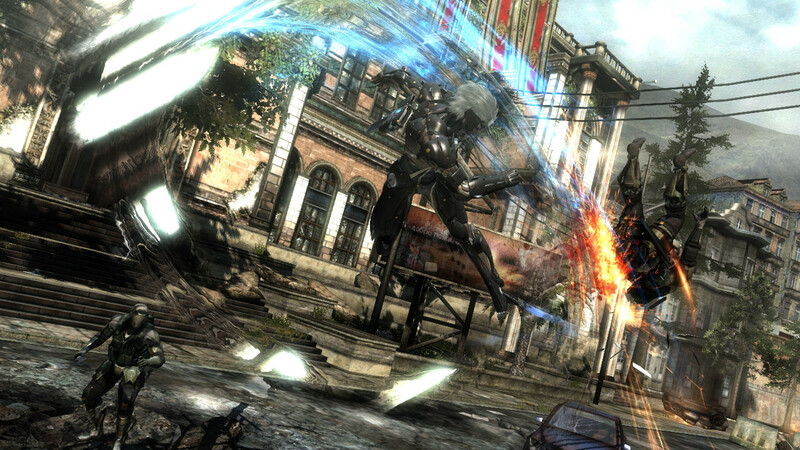 Raiden must use his mind-blowing skills to put a stop to war for war’s sake. The story isn’t that wonderful, but you play a game like this for the combat, which in MGR boils down to one act — cutting things. Like, everything in sight. Blood and limbs will be absolutely everywhere. As you beat on an enemy, parts of it’s body will start to glow blue. These are the parts you can then hack off with your sword. The signature ability of MGR, and one that is satisfying each and every time you use it, is Blade Mode. When in Blade Mode, time slows to a near stop. You can then pinpoint your strikes, cutting enemies exactly as you see fit. Experience is awarded for slicing off limbs, and some commander-type enemies reward large bonuses for chopping off their left hands (it’s where data is stored… I told you the story wasn’t great). Different bits and pieces of enemies and the environment hang around as you slice them, allowing you to really enjoy your destruction. Most enemies, if cut the right way, will reveal it’s cyborg spine. Raiden can then rip out that spine and destroy it to fully heal his life and energy. Defense is practically non-existent, which is just how I like my hack-and-slash games. The only active defensive ability is the parry, which can be done by simply attacking in the opposite direction of an oncoming strike. There is also Ninja Run, an auto-parkour sprint that allows you to jump over obstacles and climb walls with ease. Each step leaves a little lightning effect on the ground, too, just for good measure. MGR is absolutely beautiful. Everything from the enemies to the environment is stunning. As you cut your way across the game, bits of hacked-up enemy linger on the screen just long enough for you to truly enjoy the destruction you’ve caused. There comes a point where there are too many independent pieces on the screen and the frame rate suffers, but I only saw that when I was practically asking for it. Blade Mode never gets boring during the seven or so hours you’ll spend playing through MGR. I mentioned in a previous review that paying full price for a game so short is absurd. I’ll take it back if the game I’m playing is a runaway freight train of aggression. There is no time to rest in MGR, no filler missions just to flesh out the story and make the game longer. The only time the onslaught stops is between missions when you can upgrade Raiden’s life/energy, offensive firepower, and skills. You can even buy a sombrero! “Skills?”, you may say. “How do I use these skills?” I played through the entire game and I honestly don’t know how to use any of the skills I bought. MGR does the absolute worst job of explaining anything that I’ve ever seen in a video game. I was about halfway through the first mission and ready to quit, wondering how the game all of a sudden got so hard. Thankfully, I found this article from Kotaku that explains crucial things that MGR does not, like how to heal outside of combat, how to lock on to an enemy, and how to save. Also frustrating is the pacing of the game. I had never played a Metal Gear game in my life until MGR, so maybe it’s normal for series veterans, but breezing through 30-45 minutes of gameplay only to be stuck on a boss fight for an hour gets tiring after a while. Then, we have the cut scenes. I remember hearing about the hours and hours of cut scenes in Metal Gear Solid 4, but WOW the dialogue just doesn’t end sometimes. Some scenes leave the point of thinking, “when is this thing gonna be over with?” in the dust, as you blankly stare at the screen waiting for control to be given back to you. The callbacks to previous games, like discussing the Patriots and calling Raiden “Jack the Ripper”, are also lost on me. Metal Gear Rising is a non-stop thrill ride with almost endless amounts of flying body parts and hyper-stylish visuals. The laws of physics are left at the door while Raiden does his thing, slicing everything from people to airplanes to buildings with his super-katana. While it does an absolutely horrendous job of explaining some of the game’s most basic functions to you and has frustrating difficulty spikes, Metal Gear Rising is a must-play for anyone looking for over-the-top action.